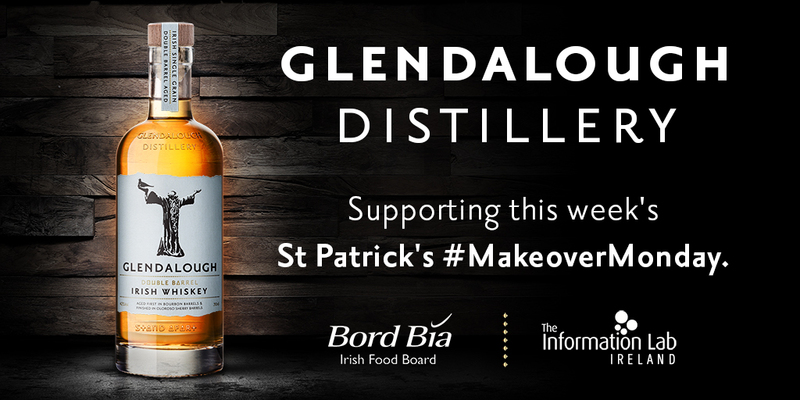 Credit goes to The Information Lab Ireland for the idea to run a St. Patrick’s Day related contest for Makeover Monday week 11. 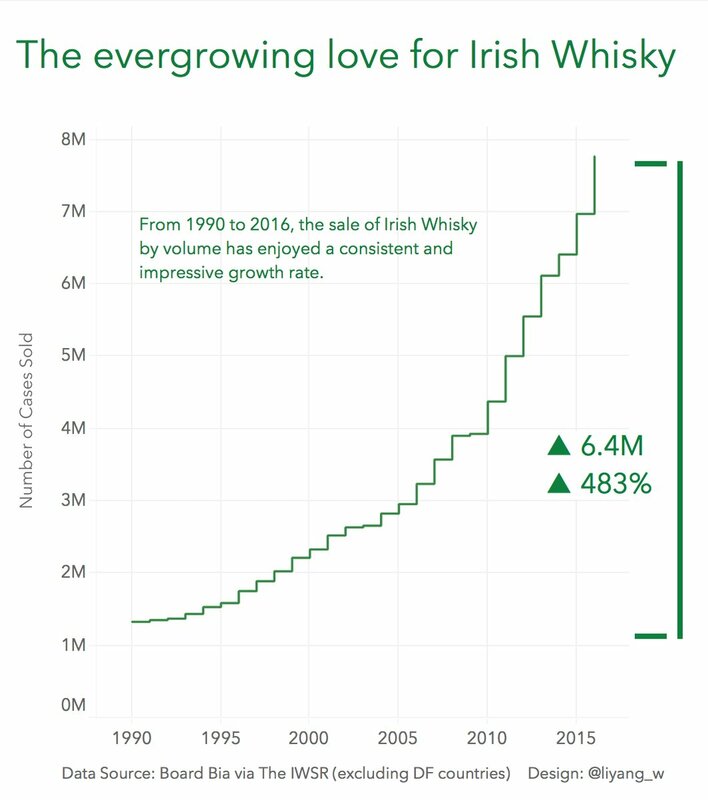 They worked with the Irish Food Board to get the data from The IWSR and secured sponsorship from Glendalough Distillery. Yesterday we announced the winners of the three bottles of whiskey that were up for grabs. I’m not exactly sure how many vizzes were created this week, but it sure seems that the prize incentive increased the volume this week. 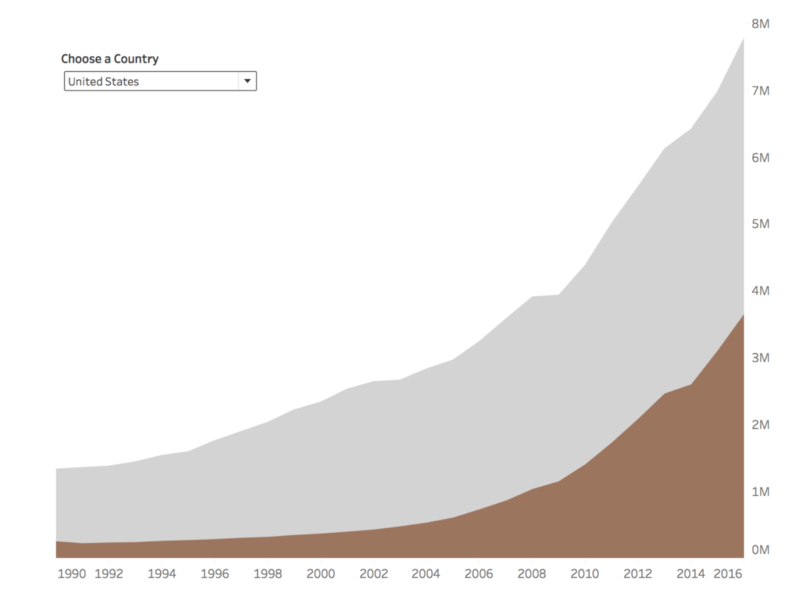 We saw quite a few commons themes across the vizzes like stacked area charts, comparing the US to other countries, etc. It was nice to see so many people finding insights in the data. That’s part of the beauty of Makeover Monday; each week you get to practice your analytical skills. It only comes to reason that you become better at analysis simply by practicing more. Keep it up everyone!! DF stands for Direct Fulfillment (contract manufacturer sends product directly to the customer), so in those cases the booze is sent directly to the customer, as opposed to via distributors. If you sum the totals for Standard as an example, for 2016 (DF and non DF) then you get 7 536 000 cases. However, since the DF is sometimes counted per region I think it is suitable that DF’s should be filtered out. A quick look at the difference between including and excluding those values show you the impact of not taking the time to investigate these anomalies. In this example, I’m comparing the United States to all other countries. 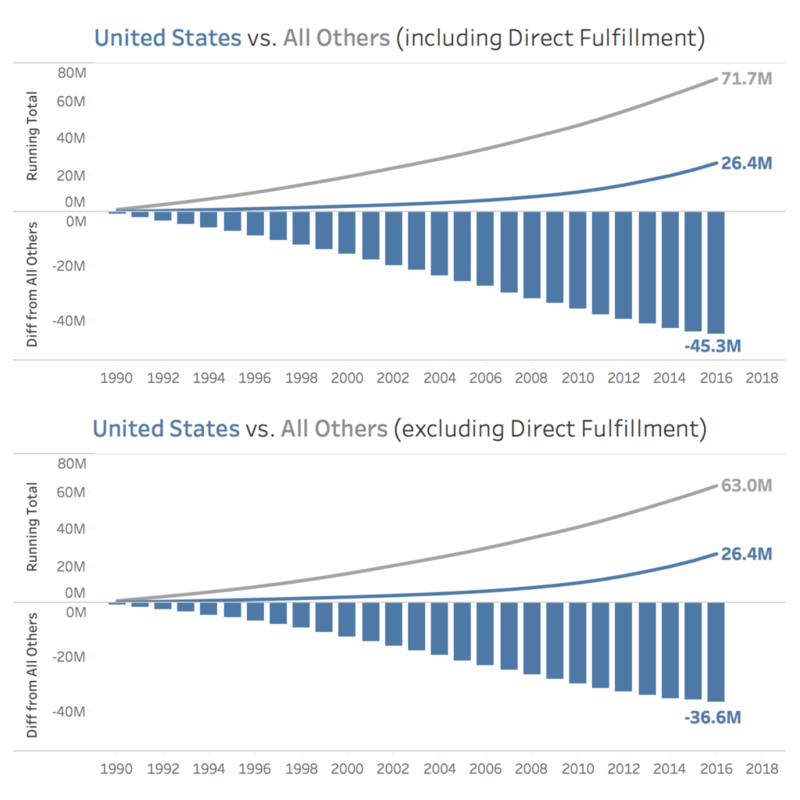 The top graph includes direct fulfillment, while the bottom does not. That’s a pretty drastic difference! 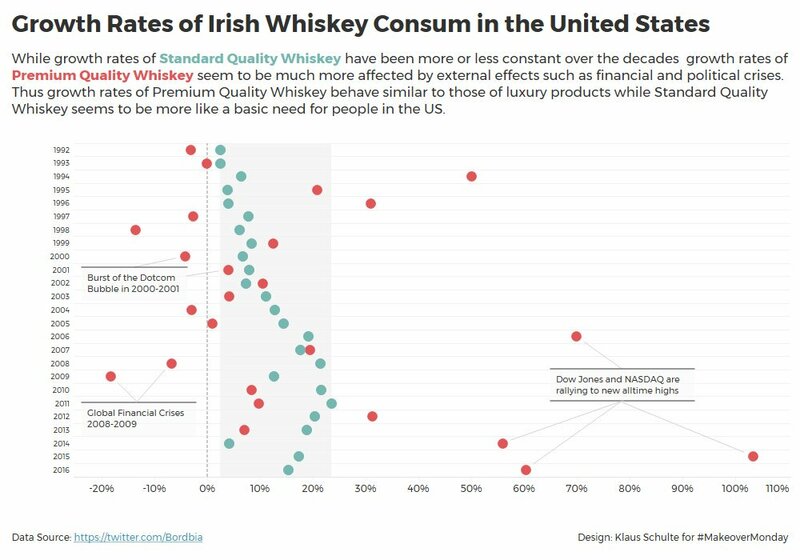 Our lesson here is to start by investigating and understanding the data before jumping into design. And if you do exclude data, be sure to communicate that to your audience. 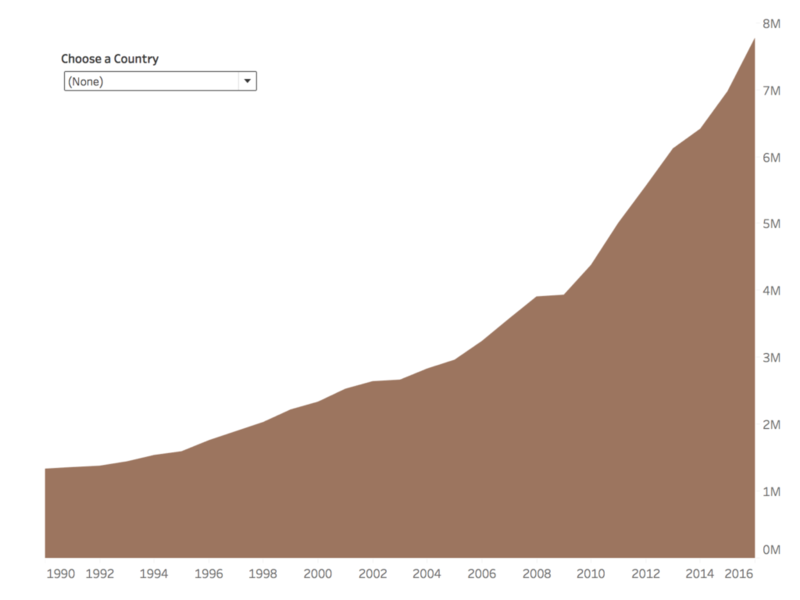 LESSON 2: HOW EFFECTIVE IS YOUR STACKED AREA CHART? Stacked area (and bar) charts have their place. For me, I only use them when I can limit the number of slices to two or three segment. Using more than that make is very difficult to see the patterns of the smaller segments. Let’s look at this example from Pouya Kholdi. 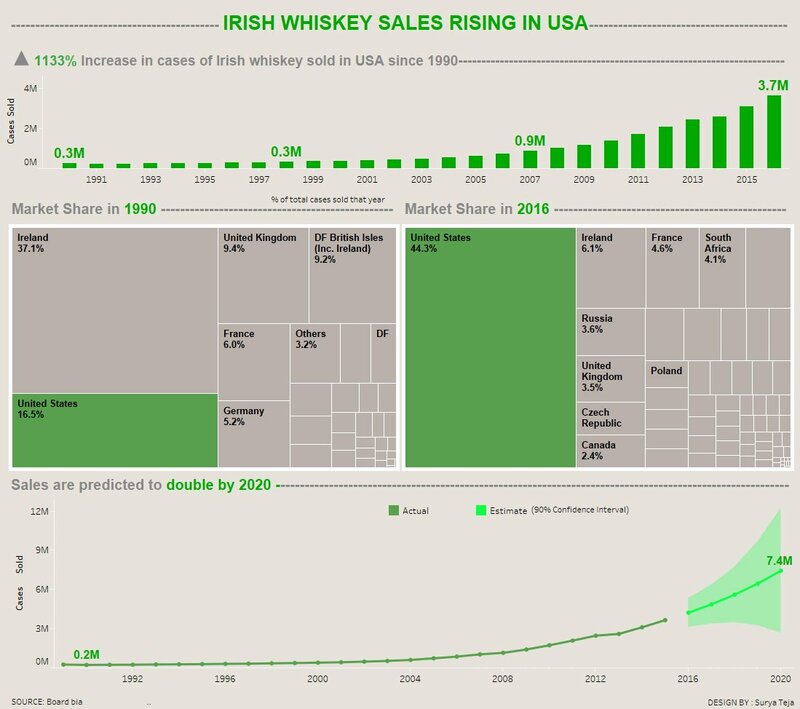 This is a very visually appealing viz. Kudos to Pouya for coming up with a unique visual that captures the topic well. 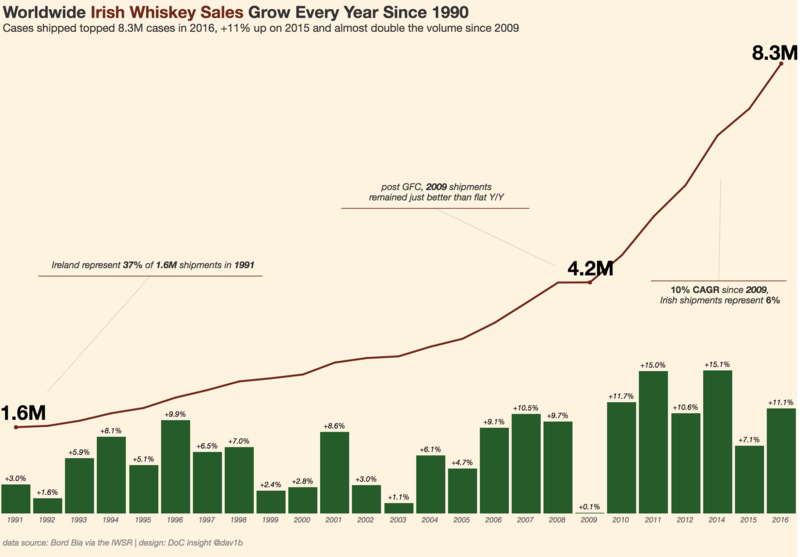 From the standpoint of showing overall growth, his viz works very well and it would look fabulous printed. On the flip side, he has provided a highlighter so we can focus on a specific country. When I choose France, for example, it’s hard to see the growth or decline of France because it’s in the middle. Stacked area charts show the pattern of the bottom-most slice well and the total well (the top), but anything in between is tough. Instead, how about breaking the viz up into two slices based on the country chosen and move the country chosen to the bottom. 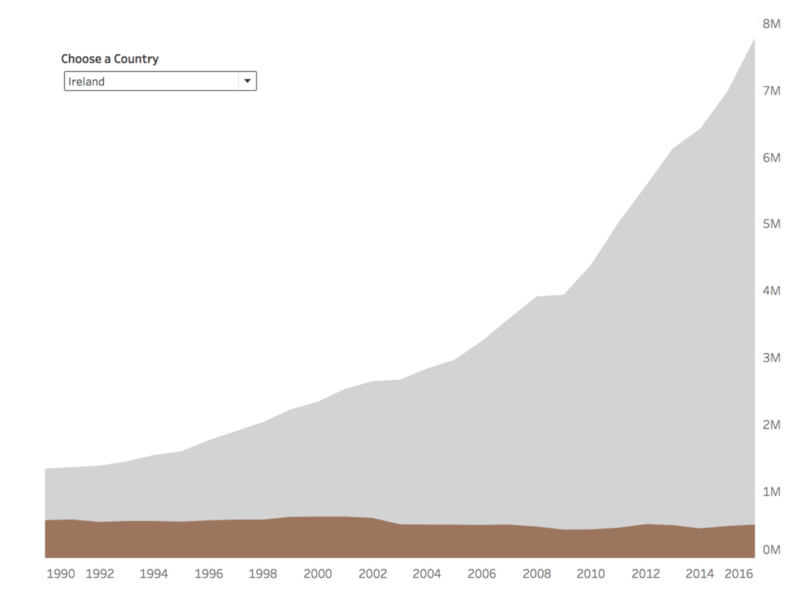 Note: I’ve had to rebuild this viz since it wasn’t downloadable. Here, I’ve used a parameter instead of a highlighter. I provide a “None” option to show the total. When a user picks a country, I then see that country compared to all others and that country moves to the bottom so that I can see it’s pattern. Here are two examples. First, when I pick the US, I can clearly see its growth in comparison to the total. 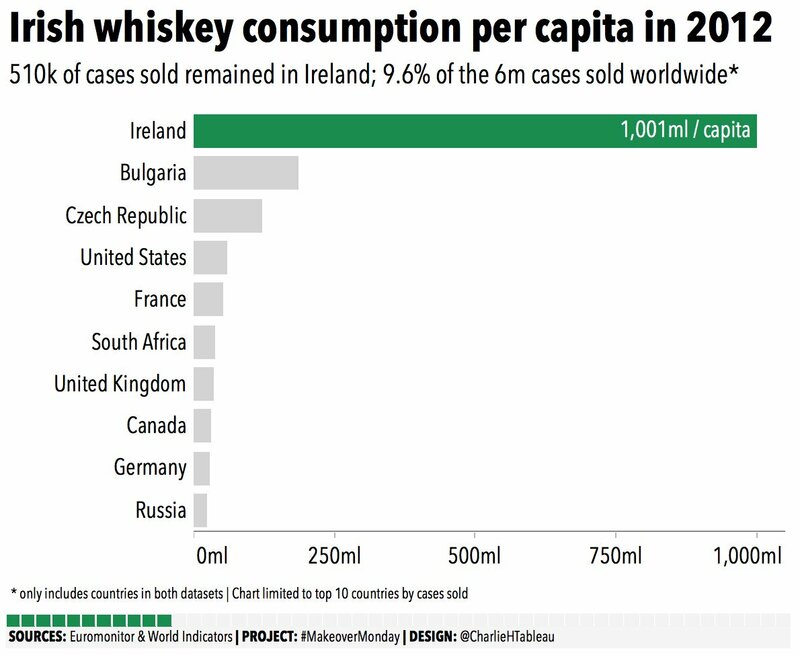 And when I pick Ireland, it’s easy to see its decline over time. Compare that to the original viz that stacks all of the countries and doesn’t move the highlighted country to the bottom. 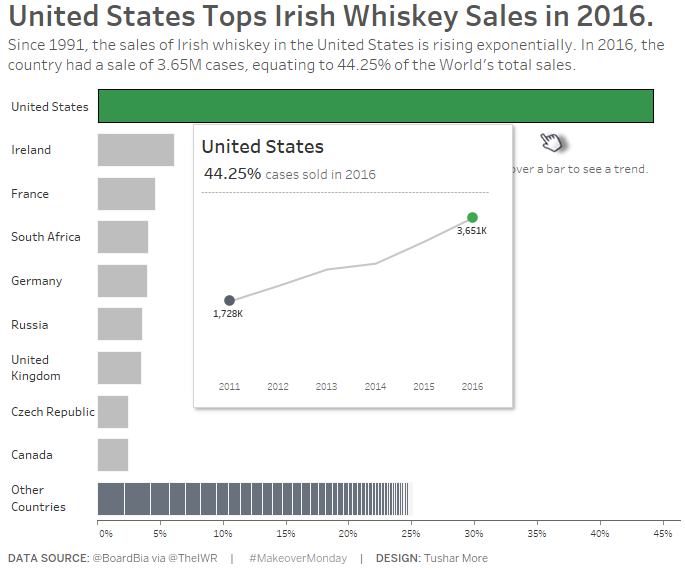 Which chart makes the decline of Ireland more obvious? Is one chart more right than the other? Of course not. If you provide a way for the user to analyze the data themselves, then perhaps this should be taken into consideration. If the original merely didn’t allow the highlighter, then I’d say it’s fine. This is only my opinion though.